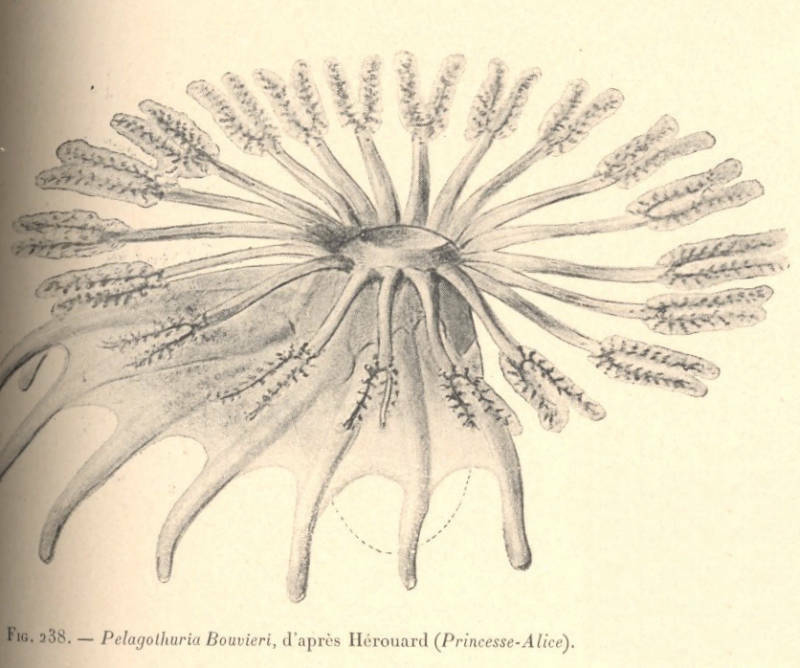 The Echinoblog: Deep-Sea Swimming Sea Cucumbers and the "most bizarre holothurian species in existence"! 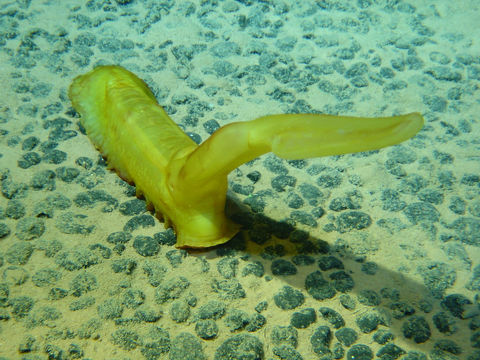 Deep-Sea Swimming Sea Cucumbers and the "most bizarre holothurian species in existence"! This week! Everyone has seen them but what do we actually KNOW about SWIMMING sea cucumbers?? Let's find out! Sea cucumbers are the very wormiest looking of echinoderms. In one sense-they resemble giant earthworms, in that they digest organic particles from the sediment which they pick up with their feeding "arms" which places food into their mouth. They eat and they poop. The organics are processed through their intestine and left as "clean" castings via the other end. They live mostly on sea bottoms. Sea cucumbers of course, do many neat things such as expell their gus as a defense and provide habitat for fish! and they are ecologically important. But in the deep-sea, sea cucumbers become the oddest of the odd!! We actually know some stuff about the biology of these animals and I asked myself last week "WHY have I never written these up before??" So, LET's GO! Data for this paper is actually available for download from the Smithsonian Digital Repository: Miller & Pawson, 1990 in the Smithsonian Contributions to the Marine Sciences # 35! Plus other citations as mentioned below. Dave Pawson was gracious to help provide info for the first three points.. Proper swimming sea cucumbers haven't been observed to eviscerate (expel intestines as a defense) like the shallow ones do, in fact, its unclear if they eviscerate at all. The bodies of swimming sea cucumbers are often VERY gelatinous and composed mostly of water, such that they are often neutrally buoyant-and are often "pushed" around by currents created by nearby submersibles. Its thought that a large proportion of sea cucumbers are capable of swimming. All "proper" deep-sea cukes live in the deep-sea.. often in the neighborhood of 500-6000 meters deep! (Mt. Everest is about 8848 meters tall) and individual species are often occur widely-so the SAME SPECIES might be present in several different oceans! 1. There are Different KINDS of Swimming Behavior! Facultative aka The Cuke CAN swim but only in an emergency! It turns out that most sea cucumbers are capable of some kind of swimming behavior but most only do so as an "extreme" response to predators. For example, this shallow water North Pacific sea cucumber Parastichopus can undulate its body and move out of the way when it senses the predatory sunflower star (Pycnopodia) in close proximity. So, the word "benthos" refers to the bottom and "pelagios" refers to the watery 3-D space that exists above it which makes up most of the ocean. 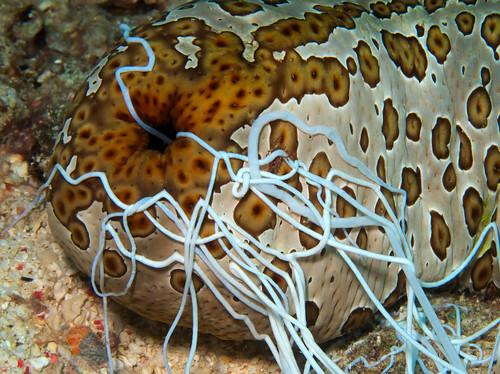 Some animals (not just sea cucumbers) actually live a life that places them somewhere in between the two.. Hence the name.. "bentho-pelagic." 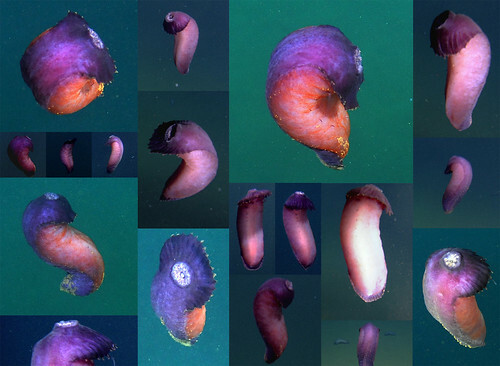 It turns out that MANY species of "swimming" sea cucumber only spend PART of their life actually swimming. You can see this in this video.. It lands and takes off again..
A paper by the Japanese deep-sea biologist Suguru Ohta (which you can download here) studied the deep-sea swimming sea cucumber Enypniastes in Japan. Ohta-san produced this excellent diagram showing the swimming behavior of Enypniastes relative to the direction of the current and the swimming behavior/motion/actions of the animal. The images below showing various stages of swimming in Enypniastes are from the SERPENT Media Archive via the Encyclopedia of Life! At a recent scientific gathering, it was noted that upon "take off" Enypniastes will Poop! 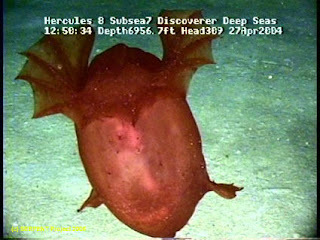 ..the ubiquitous swimmer Enypniastes eximia always swims down to the bottom to load up its intestine with delicious mud (and it feeds very rapidly for a sea cucumber, stuffing handfuls of sediment into its mouth as if there's no tomorrow), and then it swims away with a full intestine. An image presented below shows this behavior as the animal has "landed". You can see the feeding tentacles which gather fine flaky organic matter called "marine snow" and put it into its mouth. An aside: sea cucumbers such as this weird fellow called Psychropotes mostly "facultative"-they can swim... but need a good reason to as adults. Image by Lenaick LEP via the Encyclopedia of Life! Potentially, this shows that behavior can be complex and related to things like growth. 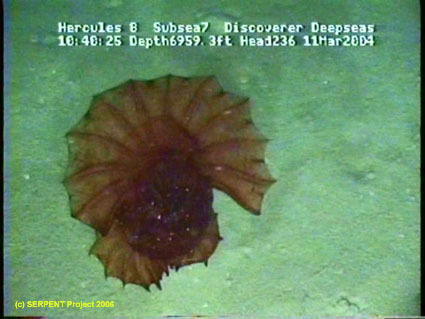 So far we've only seen sea cucumbers that swim but are not actually pelagic.. that is, they do not LIVE in the three dimensional space of the ocean like a jellyfish. but there is ONE species which DOES SWIM ALL the time. In other words a TRUE swimming sea cucumber. Let me introduce you to Pelagothuria natatrix. 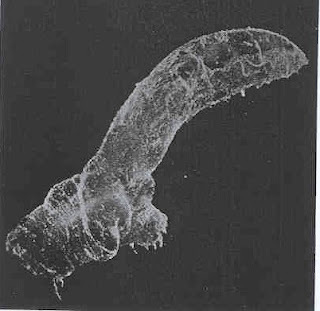 Miller and Pawson describe this species as "...perhaps the most bizarre holothurian species in existence." 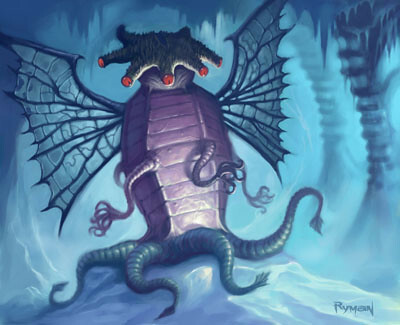 and yes.. it does have that Lovecraftian/Elder Thing-Mountains of Madness vibe going on doesn't it?? Why? Here are some drawings of the animal. 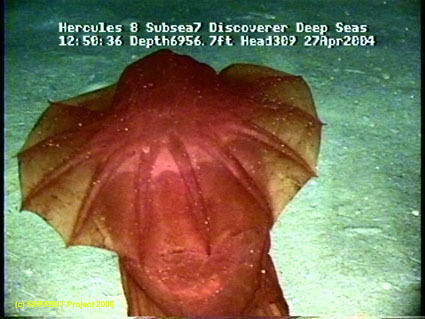 The mouth and feeding arms face "upwards" and are recognizable but they sit at the center of a jellyfish-like veil on strongly gelatinous body. Here is the veil extended. Mouth facing upward... That veil/umbrella? seems to be formed from the tube feet or podia modified into this swimming apparatus. 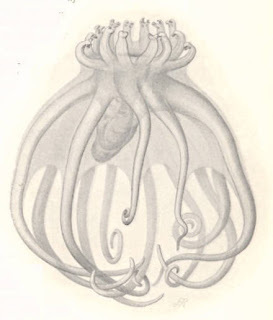 More detail on the mouth with the feeding arms shown in a radiating pattern around the mouth..
and more detail on the feeding arms at center and the tentacle-like veil around it. Miller and Pawson report that its food apparently consists of pelagic food sources: organic particles in the water, pelagic snail shells and other small floating debris. 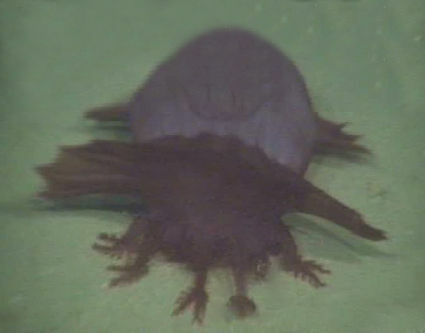 Pelagothuria is known primarily from the deeps of the Atlantic, Pacific and Indian Ocean between 596 to 6776 meters. Here are pictures from Miller and Pawson's monograph which show some of the few images of the animal alive. 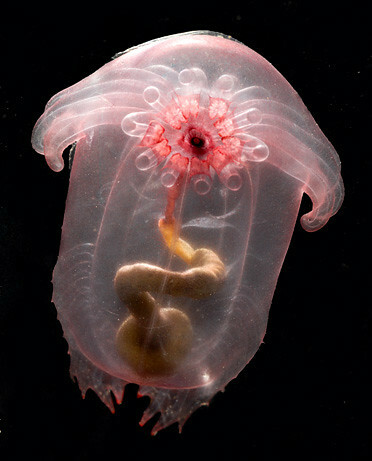 Realize that a sea cucumber that is ACTING LIKE A JELLYFISH is pretty frakkin' WEIRD even for an echinoderm. 2. Why Do Swimming Sea Cucumbers Swim?? Avoiding Predators. The facultative swimmers obviously run in response to a predator-so why not the others? Swimming takes them out of harms way quickly and effectively. Escape Physical Danger. Swimming sea cucumbers can maneuver themselves out of the way of underwater mudslides and other physical hazards. Getting around aka "dispersal". Swimming or floating is a good way of getting around to find food, spread your genetic material. Many species are cosmopolitan-that is, they are found in ALL the world's oceans. Go Where the food is. Remember when I wrote about sea pigs? What those sea cucumbers and others LOVE more than anything is fresh, delicious goo and junk that has just fallen onto the sea floor. Swimming is one way to pursue that tasty, yummy food. Absorb nutrients from the water. Could there also be further dissolved food (organic matter) that the animals could absorb through their body wall? 3. How many different KINDS of swimming sea cucumbers are there and how are they different from "typical" sea cucumbers?? There are swimming sea cucumbers in ALL of the major groups of sea cucumbers. Miller and Pawson summarize accounts and find 25 different species that have been recorded swimming or are capable of swimming even a little. Five of those seem to be shallow-water with the remaining inhabiting deep-water. 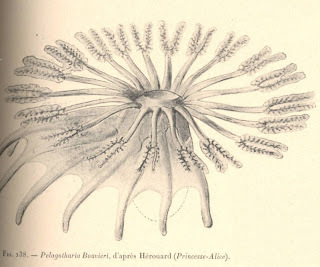 Most deep-sea swimming cukes belong to the families Pelagothuriidae, Elpidiide, Psychropotidae, and the Synallactidae with the adaptations for swimming seemingly haven arisen in the evolution of sea cucumbers at different times in their history. 4. What else is there about swimming sea cucumbers that you aren't telling me?? At least a couple species glow in the dark! 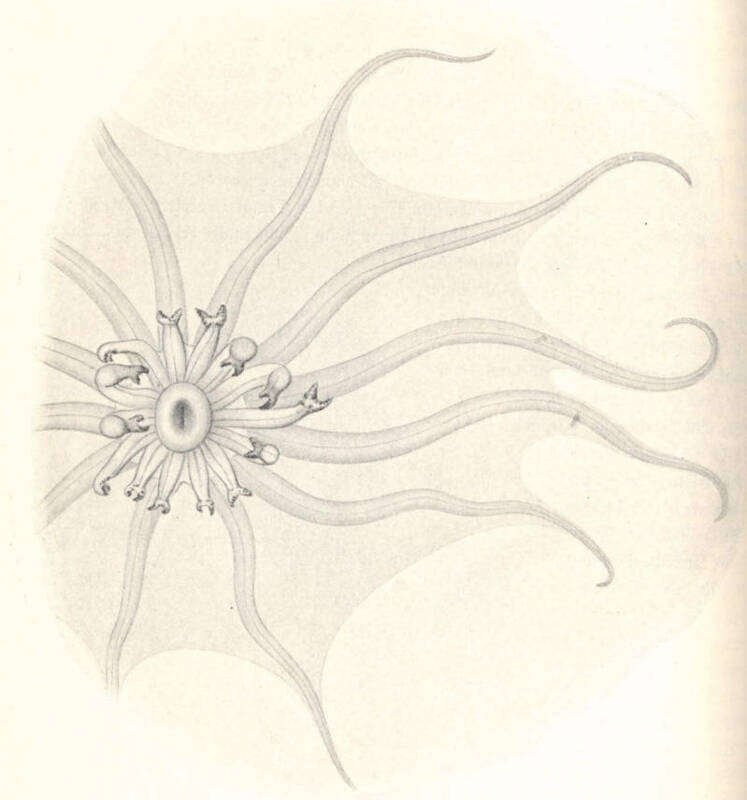 Enypniastes is thought to use its bioluminescence to scare off potential predators. See this paper for more..
How much is known about the purely pelagic species? Other than some video observations from various submersibles and museum specimens, there's very little known.